Gov. John Kasich (R-OH) is paying his top staff members significantly more than the previous administration, but his total office payroll is $300,000 less. He is cutting the total payroll by eliminating eight positions and decreasing the pay of his lowest staff members. Yes, you read that correctly, his fiscal conservatism only applies to administrative assistants, receptionists, and mail clerks. 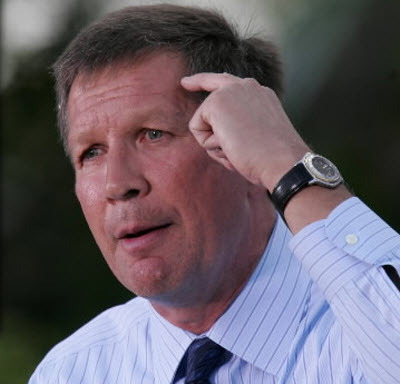 Kasich is paying his Chief of Staff $170,000 which is $47,000 more than former Gov. Strickland’s Chief of Staff. He created a special position for his crony from Lehman Brothers that pays $25,000 more than Strickland’s Chief Legal Counsel. His Communications Director is earning $31,000 more and his Press Secretary will get a $20,000 increase. So the $120,000 raise he gave to his top people needed to be offset with some cutting on the low end-as it were. He eliminated eight positions at a time when Ohio’s unemployment level is hovering near ten percent. One administrative assistant is going from $35,000 per year to $23,000 and another is taking a $5000 hit. The two mail clerks have had their pay reduced from $31,990 and $27,997 to $25,000 per year. His receptionist will be making $1000 less this year thanks to the sharp-eyed salary cutter! Kasich has defended the huge increases by saying that in order to get the best people he has to compete with the private sector. This is totally ironic because he also said that government workers are paid more than their private sector counterparts…apparently just the low-enders. Furthermore, most of his top staff members have experience in government not the private sector! The one exception is Jai Chabria, his crony from Lehman. An yet the good ole sheeple of Ohia keep voting for the Pubs. Gotta love it. I just can’t seem to get in the minds of the people that vote for the very party that prostrates them?? Gonna have to break out Deer Hunting with Jesus for a freshen up.